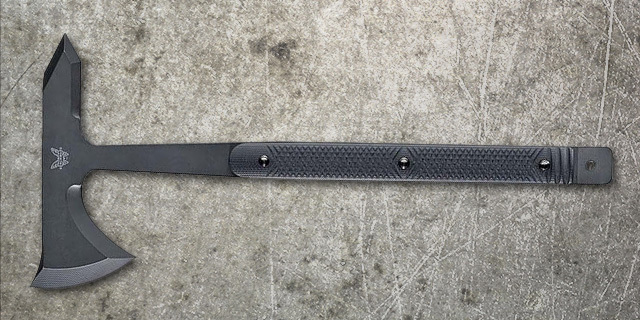 The Tactical Hawk by K5 Tactical is made from 3/8″ thick high carbon steel. 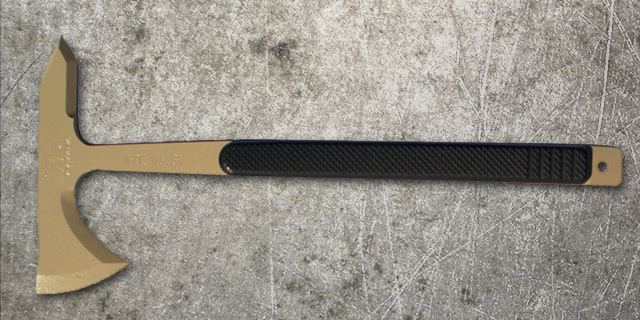 The edges are hardened, and tempered, bnt the handle is left unhardened for its shock absorbing ability. The Hawk is powder-coated tan over its entire 16.5″ length. The head is 5″ long with a 3.5″ Edge face. The beard also has 3 inches of sharpened edge for hooking moves. The Handle scales are 6061 T6 Aluminum that has been MIL Spec Type III Hard Anodized with a greenish tint. Designed by Eddie Killian specifically as a breaching tool, the Benchmade Tactical Tomahawk Axewith Pry Bar & Spike has 1095 blade material and a contoured G10 handle, making this tomahawk a very dynamic tool. Superior features include a full-tang handle with G10 scale, wedged end for prying, and an apple seed mill bevel for increased edge life. Founded by Eddie Killian in 2005, Durango Colorado based K5 Tactical is providing SAFE, reality based, commonsense education and products that empower everyone from the individual to government agency personnel. The hallmark of our performance is pragmatic application of a wide body of engineering knowledge, field experience and training that industry leaders utilize to enhance their own competitive edge in the Military, Law Enforcement and Public Safety communities.